On the weekend, four friends from the EarthSong Mysteries circle joined my partner and me in our home to mark the Autumn Equinox. We began casually, enjoying a pot-luck lunch, a couple of jokes, and conversation. Then the six of us descended to the basement room for council circle and ritual to honour the natural threshold we were crossing. What way(s) of holding such contrasts do YOU perceive in the Princess of Swords? Please share with us. 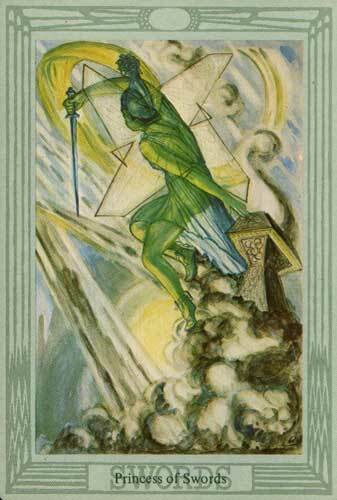 Image: Princess of Swords from the Thoth Tarot (Lady Frieda Harris & Aleister Crowley). The Elora Tarot Project is Fabulous! On Friday evening, my partner, a friend, and I attended the opening of The Elora Tarot Project art show at the Wellington County Museum. Wow! The exhibit is extremely good and really works as a deck (of course, I got one!). Paintings, carved glass, collage, and even a water fountain make up this collection of tarot images. It was heartening to experience the *large* and enthusiastic turnout. Congratulations to all the artists, to Shelley Carter, and to the tarot for weaving such a sense of community. Out of our connection with one another emerges great healing. 1. What pulses in the heart of this project? Seven of Wands. The vision of a new life-loving world that can emerge from the dust of the old world. 2. What challenge around this project was successfully overcome? Seven of Pentacles. Finding the single “plant/vine” that could unite the diverse artistic forms of “fruit” that grew as the project evolved. 3. How was that challenge overcome? King of Swords. Authority, precise communication, and absolute honesty. 4. What greater good can emerge from this project? Six of Wands. Recognition that dreams and goals can be made into reality to become ambassadors of the triumph of the imagination. I’m excited that Tarot Counselling for Self and Others will be underway very soon (we begin on the 20th)! Why? Because I feel that the tools and processes offered in the course are valuable ways to encourage connection, creativity, and healing in a culture that seems to have put these things on the back shelf. The tarot can be so much more than something that’s read at people; it can be a splendid invitation for the soul to come forth and tell us what we most need to know or learn in order to grow and evolve. If you’d like to hear the story of my own journey with that, please click HERE. So, how will we spend our eight weeks together? First, we’ll enter the process consciously: learn a bit about one another, bring our previous tarot experiences to the table, and figure out together what tarot counselling can be for ourselves and in the larger tarot community. The container for our good work will be woven. You’ll learn the value of creating strong, safe consultation structures wherein physical and emotional safety are present and wherein the Muse can pour inspiration and learning in ways appropriate for the recipient of the session (whether self or another). One of my favourite frameworks is the use of tarot spreads that encourage insight. I’ll offer you some that I’ve created myself and some made by others, then teach you how to craft tarot layouts that will make your sessions sparkle with specificity! Other techniques you’ll gain include presence, witnessing, attention, and intentional communication. How can we be as present to the seeker’s and our own experience as possible? How can our statements be as non-judgemental and constructive as possible? What questions will evoke the soul’s profound truth? These will be explored and practised in simple, nourishing ways. I’m sure we’ll inspire each other! Did you ever finish a tarot session and wonder, “Now what?” No more! Head knowledge is not enough. In Tarot Counselling for Self and Others, we’ll play with imaginative ways to take the insights gained during the consultation into consciousness, into the body, into real life so that constructive change can take place within and without. One of the great things about this course is that people have the opportunity to DO the material, hands-on, with one of their peers, a “study buddy”. Again, head knowledge is not enough; there’s no better teacher than experience and sharing with someone who is also working with the same materials. To conclude, we’ll harvest the wisdom of our time together, set concrete goals, and take our sacred work out into our communities. And you’ll receive a comprehensive recommended reading list to further your studies. Please join me on this profound tarot journey. You can sign up by simply clicking on http://www.gaiansoulgrove.com/jameswells-tarotcounseling/ . Your sense of satisfaction at shifting from card reader to soul companion will be palpable. And those who consult you will thank you for daring to work so deeply. Image: #2 — The Goddess (High Priestess) from the Cosmo Tarot by Carol Herzer. Registration for Tarot Counselling Course is OPEN! And I have to tell you that there is a really COOL bonus for the first TEN people who sign up . . . so if you’re interested, please go there and check it out! Next week on Wednesday, Sept. 18th at 8 p.m. Eastern Time (5 p.m. Pacific Time), I’ll offer a preview call of my e-course, and would love to have you join in. I will share some of the basic ideas that I’ll be covering in the course, and you’ll have an opportunity to ask any questions you might have about it. Image: 10 of Flame Songs from the Songs for the Journey Home tarot deck. Did you know that the tarot is so much more than something you read while someone passively listens? Did you know that the tarot can be an encounter of discovery and transformation? You can click on http://www.gaiansoulgrove.com/jameswells-giveaway/ to watch a *free* video about my pilgrimage from simply reading cards to offering tarot counselling *and* to receive a PDF of a very cool process/spread that I know will enhance your own tarot practice. This autumn, beginning Friday, September 20, you can join me for Tarot Counselling for Self and Others, an eight-week journey that will change readers of cards into soul guides. Every week, you’ll receive helpful handouts and activities, enjoy enriching discussions in an online forum, practise with one of your fellow course participants (“study buddy”), and take part in a live teleseminar with me. This way of working with the tarot is something I call Evolutionary Tarot. Your participation in Tarot Counselling for Self and Others will contribute to your personal evolution and teach you how to assist others in theirs. And you will join those who are on the cutting edge of the evolution of the tarot itself. I look forward to companioning you on this eight-week adventure this autumn! Feel free to share the link with your tarot-loving friends! You can sign up here to watch a F*R*E*E video about my pilgrimage from simply reading cards to offering tarot counselling *and* to receive a PDF of a very cool process/spread that I know will enhance your own tarot practice.